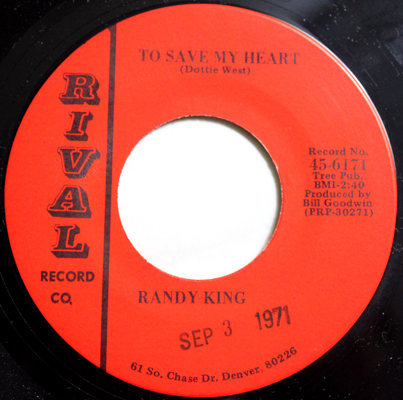 Another sift through my Colorado 45 collection reveals an inordinate number of singles (on several different labels) from Randy King. As always, if you have anything to add, contact me through the comments section. 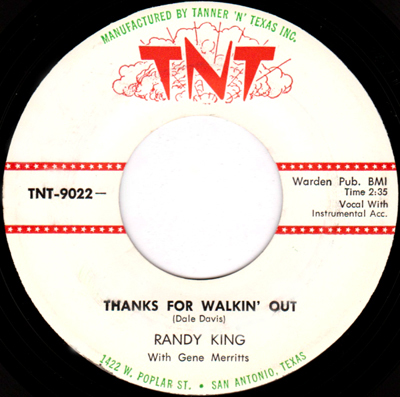 1954 – TNT 108 "Crazy as a Loon" / "Tied and Bound"
1957 – TNT 9009 “Be Boppin Baby” / "Whispering Wind"
1957 – Whiz 1501 – "Since You Came Back to Me" / "Blue and Lonesome"
In 1961, Randy (and Gene Merritts) released the Bozo Darnell penned "It's Me Again" and the flip "The Last Show" on the Darnell Jaybo label (2485). Interesting note, while the label clearly shows "Denver Colorado," Billboard lists it located at "1004 Eleventh Place, Big Spring, TX"). On the record label - this was a partnership between Bozo and a guy by the name of James something -that lived in your area (Odessa). They took the Ja put in a "y" and then Bo (yes for Bozo). "End of the Hunt" (a Bozo Darnell release) was cut in Denver and Bozo was playing Wyoming so they used Jeffery City as a return address for anyone wanting to order records. Later on Bozo and James dissolved the label, as if I recall what Bozo said that, James was no longer interested and it was not a profitable thing. So when we married the label became J-Bo (kept the same color of label) and since Bozo had been on Jaybo it sounded the same on the radio. The J is for my first name which is Jo. About that time Randy hooked up with Colorado country music promo queen Gladys Hart of Country Music Enterprises / C&W Record Promotion, out of Denver. Gladys founded the Colorado Country Music Foundation, and in 1962 hosted the the first Country Music Festival, which would go on to be celebrated every year in Denver until she passed away (she was inducted in the Colorado Country Music Hall of Fame in 2003). 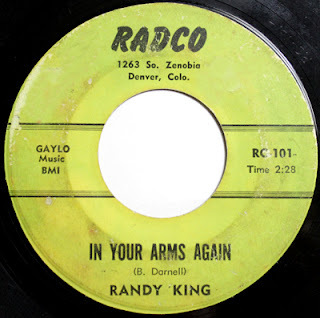 Gladys' home address (1263 Zenobia, Denver) is noted on Randy's Radco release (and another Bozo Darnell penned song) "In Your Arms Again" (Radco 101). 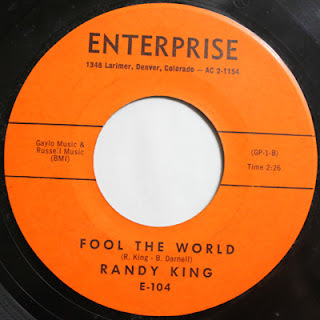 Randy kept ties with his West Texas and Big Spring friends with the 1962 release, "Fool The World," again written by Bozo Darnell (the flip was was the re-release of "Hearts Entwined" - Enterprise 104). Both the Enterprise and the Radco releases also note Gaylo Music - Gaylo was a Big Spring label/publishing company owned by Ben Hall (In 1959, "Hearts Entwined" was released by Bozo Darnell on the same Jaybo [J-Bo] label which released King's "The Last Show"). 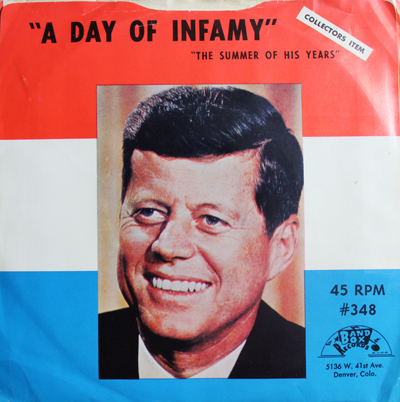 Included in his Band Box discography is a two-sided John F. Kennedy memorial disc - the spoken word “A Day of Infamy” and the folksy “In The Summer of His Years” (Band Box 348). The label indicates that the song was written for a BBC tribute. 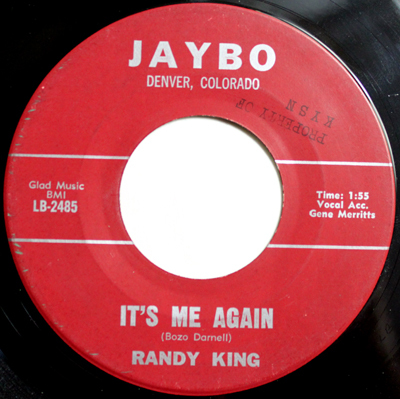 King's affinity for jumping to new labels continued, as noted in a 1965 Billboard, which indicated that he had moved on to Cheyenne Records, and released "Gitar Picker's Lament" / "That's Tarzan" (4466). However, he must of kept his ties with Band Box, because a Feb. 11, 1967 Billboard ad (below) touted him as a “Promising new addition to the growing Band Box family of fine country artists. Rival 3168 - "Memphis" / "The Prisoner's Dream"
Rival ???? - "Laugh a Little"/ ?? Found confirmation that King also owned the Club Corners nightclub, in Denver. That's it. 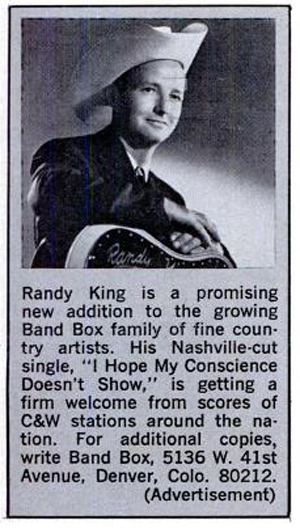 That's all I have on Randy King.